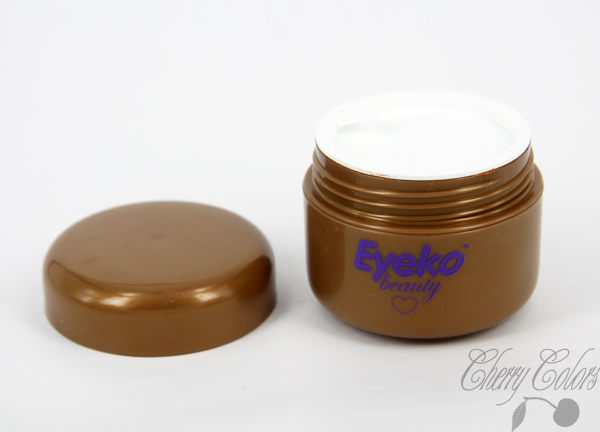 Review: Eyeko Tinted Moisturizer - Cherry Colors - Cosmetics Heaven! I bought this product because it was on sale and for the price of one I got two products (this plus the Extra Glow one). So for both of them I paid 10.90€ which is actually a good price. I absolutely love the box it comes in. It's gorgeous. Super pretty! But I can't say the same for the packaging of the product. That brown thing is just... ew. Really cheap looking and for almost 11€ (regular price) I'd expect a better looking packaging! When you open the cream you can see there's some kind of protection, so the cream doesn't get spilled out. That's nice, and I like it. The cream has some weird scent. A bit plastic like but not overwhelming. The cream is thicker than your average cream. It dries quite quickly, so you have to be careful. Plus it's quite sheer so you don't get a lot of color from it. 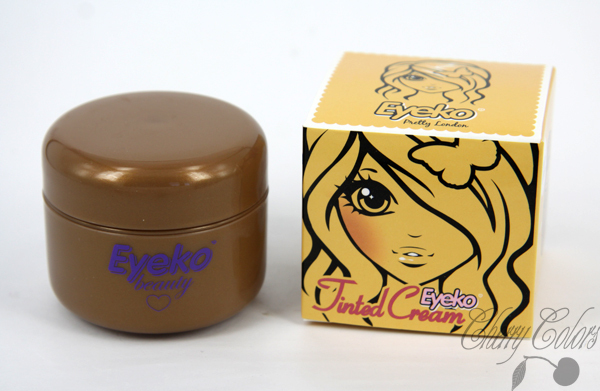 The cream itself if a nice shade of brown, well more like a bronze color with tiny sparkles in it. Actually upon closer inspection, it looks brown with bronze sparkles. But on the skin the sparkles aren't visible most of the time. 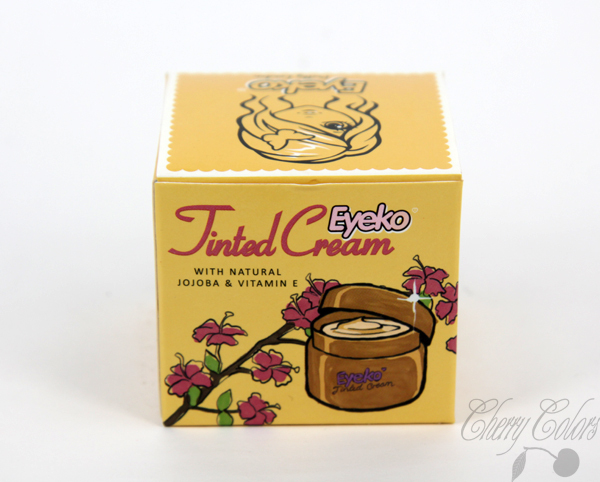 I tried using this cream as a facial cream, for contouring. Well it worked well, but it took me a lot of time (I was using a stippling brush). Plus I needed to apply quite a lot of cream to get some definition. It works well as a cream on my skin, even for light definition (I'm guessing that's what most people want anyway), so I won't give up on it. That's why I decided to try to use it in other ways. I got this terrific idea to use it as a bronzing cream on my legs. My legs are super pale and when I was wearing a black dress, well I had the idea they were just too white! So I applied quite some cream on my legs - and tadaaaaah! Lovely sun kissed legs. But the cream does dry quite quickly (I'd say in about 60 seconds) so you have to be quick! Really quick, especially if you're covering bigger areas of your body. Later that day I got a weird feeling, it was like the cream was melting under my knees. I was sweating like a pig, so that wouldn't be strange at all. Also when I sat down I had this sticky feeling, like the cream would transfer to things. Bleh! I didn't set it with powder, but maybe next time I should. It ended with me rubbing the thing off because I couldn't stand the sticky sweaty feeling. I prefer having white legs than having tan lines along them. Once I tried using it as a bronzing cream under my MINERAL foundation and from far away it looked alright. But when I got back home I realized I had an obvious streak around my cheeks. Ew! Terrible! I have no idea how I missed that one out. I read that some people use it as an all over make up base, but I won't try that because I'm way too pale. I'll just use it as a light bronzer for under my foundations. Well I tried loving it, but sadly now it just sits on my shelf waiting for better times. I'll use it up during the summer, to add some color to my neck, shoulders and cheeks. 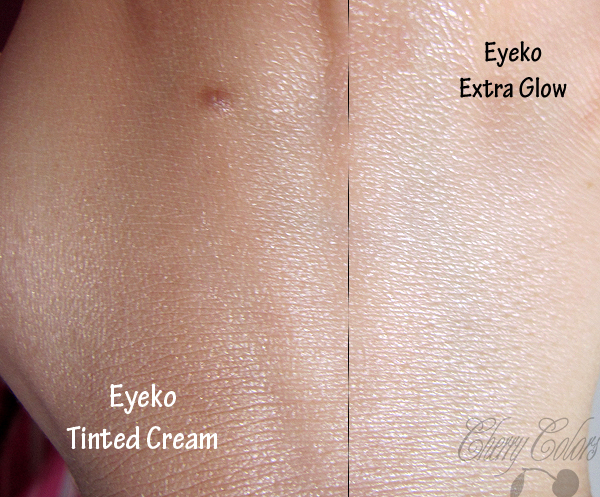 Since it's so sheer you can mix it with your regular cream and use it as a tinted moisturizer. I would like it even more if it contained no parabens, because then it could be used daily. I prefer creams with natural ingredients.